I think there may be a bias among photographers with some experience, but maybe not as much as a working professional, that one progresses from full automatic as a beginner, through the program modes like aperture priority, until one reaches the level of a Jedi Photography Master who shoots in manual mode all the time. Not exactly, but it is true that shooting in manual mode requires some confidence in one’s ability to use a camera. In reality, however, the seasoned pro will use whatever works best for each situation. In some cases, manual mode may not be easier than aperture or shutter priority, but it will be more reliable. In other cases, of course, you have no choice. In a studio, shooting with strobes, your camera’s built-in meter is useless, having no way to measure the light from the flashes, so you have use a handheld meter and shoot in manual. There are other situations when shooting in manual will at least produce more consistent results than either of the priority modes. One example would be a sporting event like a soccer (or lacrosse or rugby or…) game, where all the action takes place in a big open field under direct sunlight. During the 90 minutes to two hours of the game, the lighting conditions on the field are going to be very consistent. You could take a meter reading before the game starts (or just hone in on your best exposure with a few practice shots), set your manual exposure, and then leave it alone for the rest of the game. Under these circumstances, using manual mode is usually more reliable than using shutter priority would be in the same situation because, while the lighting on the players remains consistent, the background behind them does not as they move around the field. Players might pass in front of dark access tunnels or a bright concrete wall. An overly bright or dark background can trick your camera’s meter into underexposing or overexposing a shot, respectively. In manual, the exposure stays consistent, and the background becomes irrelevant, at least as far as the exposure goes. I’ve used this method for shooting outdoor events and I almost never have to worry about my exposure. That means I can focus on other things like composition, focus, and not missing the shot. There are a few tricks that I use to get the best exposure beforehand. Before the real action starts, I take a few test shots in either the aperture or shutter priority mode, bracketing by a stop, and pick the best one. I may then take a second bracket, this time only varying the exposure by a third of stop, letting me zero in on the best one. A good histogram covers the full range from black to white. When you do this, do not rely on the image on your camera’s LCD, especially when you’re working outdoors. You need to check the histogram, looking for an image where the histogram has “peaks” running through the entire graph, and not bunched up at one end. Because the image and the histogram on your camera is based on a fake JPEG image and not the actual RAW image, set your “picture style” to the most neutral selection possible. This will be closest to the final RAW file. That reminds me. You are shooting RAW, right? Once you have your best exposure, take the ISO, aperture, and shutter speed information off the LCD, plug that into manual mode, and leave it there. Another trick I might use, if I’m feeling cocky and it’s a nice clear day out, is to skip the first bracket and apply the old Sunny 16 Rule to get close, then shoot the second 1/3-stop bracket to fine tune the exposure. Whether you shoot in aperture or shutter priority mode depends upon whatever is most important. If you’re worried about depth of field, you would use aperture priority. For stopping action, you would choose shutter priority. 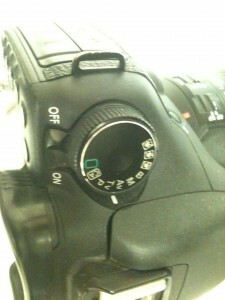 But when would you choose one of these modes over shooting in manual? As I said above, manual works best when the lighting on your subjects is going to be consistent, and the same exposure setting will work for every shot. Therefore, one of the priority modes would be your best choice when your lighting conditions are more likely to change from shot to shot. This could mean you are moving from indoors to outside or from direct sun to open shade. Under those conditions, trying to shoot in manual would end up being an exercise in frustration and missed opportunities. You can deal with this by either applying a little exposure compensation or by bracketing. If you know that your background is going to be consistently bright, you can apply exposure compensation and force the camera to overexpose the background in favor of the subject. Likewise, if the background will be consistently dark, you can use exposure compensation to underexpose the background, and correctly expose the subject. But what if the background is not predictable? In that case, I would bring a lot of cards, and bracket, bracket, bracket. In my experience, most aperture or shutter priority shots are within a stop, no more than two, of correct exposure. If you bracket by one stop, you will at worst be within one stop of a good exposure, something that Lightroom or Adobe Camera Raw could handle with its eyes closed (if it had eyes, which it doesn’t… because it’s software… and software doesn’t have sensory organs like… Oh, never mind). You might even consider using a little exposure compensation to bias the camera slightly toward overexposure when it brackets, because it’s easier to recover information from an overexposed shot versus an underexposed one. This all assumes that you are shooting RAW. If you need to shoot JPEG for any reason (because of the requirements of your client, for example), then bracketing is that much more important. You need to ensure that you get at least one good exposure of a subject before a moment is lost. As you can see, being comfortable with your camera and your ability as a photographer, doesn’t just mean that you know how to use manual mode, but you also know when not to use it. This entry was written by Paul, posted on 30 June 2013 at 1:06 pm, filed under Shoot Like a Ninja. Brands: Adobe. Software: Adobe Camera Raw, Lightroom. Concepts: Aperture Priority, Bracketing, Exposure, Exposure Compensation, JPEG, Manual Mode, RAW, Shutter Priority, Sunny 16 Rule. Bookmark the permalink. Follow any comments here with the RSS feed for this post. Comments are closed, but you can leave a trackback: Trackback URL.